This article is part of our CNC Machining and Manufacturing Cookbook. It focuses on whether to focus on saving Machine Cycle Time or Machine Setup Time to improve Shop Productivity. Presumably you've already read the first article in the series, Introduction to CNC Machine Shop Productivity. In that article, we introduced the CNC Manufacturing Workflow that we use to do overall productivity planning and assessment. In this article, I want to divide those Manufacturing Workflow activities into two categories and focus on talking about the two and their relationship to one another. As I mentioned in the first article, it's important to keep your machines busy. It may even turn out to be the most important thing of all for your shop's productivity. Certainly, it's a good place to start. Towards that end, let's call the time when the CNC Machine is busy making a part "Cycle Time". We'll call all the time when the machine is not busy "Setup Time", even though it may be idle for all sorts of reasons beyond simply Setup. Those other reasons are why the Workflow includes more than just Setup Time and Cycle Time. Nevertheless, given how important it is to keep the machines busy, we can learn a lot just by thinking about these two categories. Which Category Should My Shop Optimize First? An important first question is to decide whether you want to concentrate on reducing Cycle Time or Setup Time first. Ideally, you've collected the data using the worksheet we described in the Introduction article, and the answer should be pretty obvious. You can look at where the time and money go for each stage of the Manufacturing Workflow and focus on the low hanging fruit. For very small lot sizes, you might spend 90% of the time on Setup activities and only 10% on running the machine. 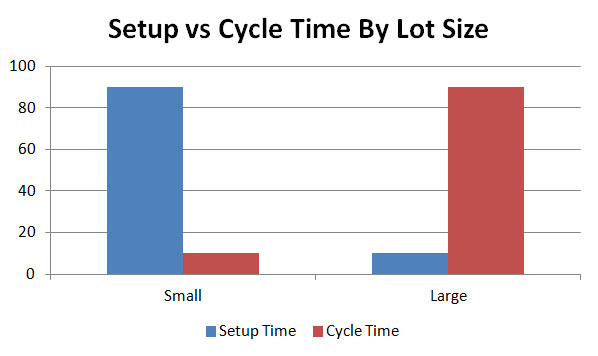 For very large lot sizes, it's reversed: 10% on Setup and 90% on Cycle time. What we can conclude from this is that it's very important to know the relative amount of time spent on each type of activity. Small lot size businesses benefit most from reductions in Setup time while large lot size businesses benefit most from reductions in Cycle time. That's not to say both businesses don't benefit from either kind of reduction, but you want to focus your energies where the most productivity gains are to be had. The type of business you run is going to have a profound effect on your lot sizes, and from that, on which parts of the process you need to optimize first. One type of optimization simply involves moving the line between Setup Time and Cycle Time. Let's assume you've got a small lot shop, perhaps a prototype or tooling business--they each do relatively small lots. You're constantly plagued by Setup Time. The machines spend most of their time idle. What to do? Note how the probe is set up--we can both measure tool length by dropping down onto the probe tip, as well as diameter. Typically, the tool is spun in reverse at a slow speed while the measurement is being made. 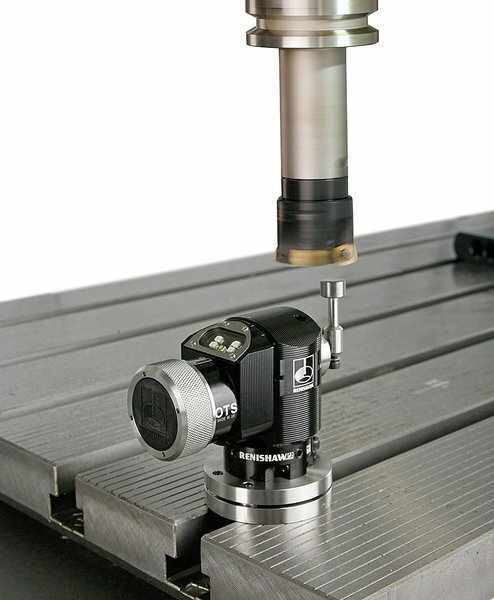 The reverse spin is so the tool doesn't cut the tool setter, and the rotation itself ensures the measurement of the lowest hanging insert or cutter tooth. This is great. Your operator no longer has to measure the offsets and load them into the Tool Tables. The machine takes care of that itself. Now let's put the shoe on the other foot. The machines are constantly busy, but you had idle Operator time. You need to get more production out of the machines. In that case, a Touchsetter is taking machine time for what could be done by idle Operators doing Offline Tool Setting. It doesn't take much--a fixture or two and an accurate height gage are a good start. Now the machines have that much more time to make chips and the Operators have a little less idle time. See how you can trade one off against the other? The trick is in knowing which trade-offs deliver the most benefit for your shop. 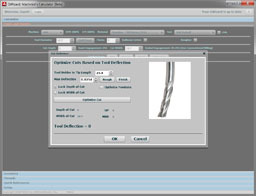 To learn more about Tool Setup, see our 2 part article series on CNC Tool Management. By now you should've read the Introduction and this article. It should be becoming increasingly clear that you need real data about how your shop spends its time and money before you can make the best impact on productivity. Gather some of that data and then go back to the CNC Machining home page and start poking around to ideas for how to improve productivity where your shop needs it the most.